Easan Feidh Climbed At Last! Steve Perry and Sophie Grace Chappell showed remarkable vision, determination and persistence when they made the first ascent of Easan Feidh (VI,6) on March 5. 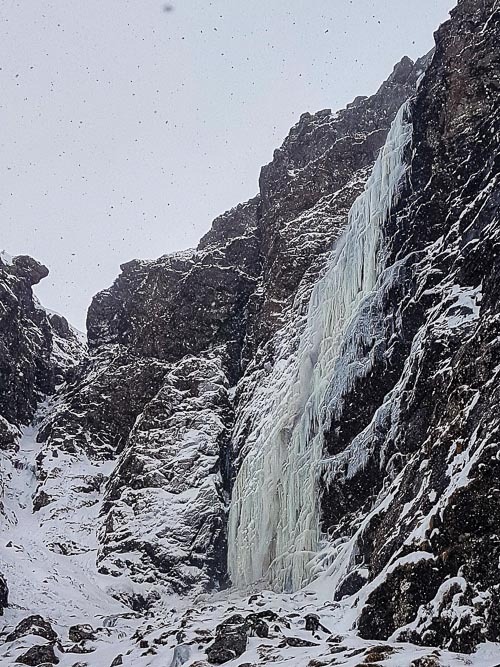 This spectacular 90m-high waterfall, which lies on Creag na h-lolaire to the south of Ben Klibreck, had been eyed up by connoisseurs of the area as an excellent winter objective for a number of years. As you trudge you start looking at the gullies across the glen on your right. Where is it? Where is our Cunning Plan? Heck, I hope it’s not meant to be there, or there, because that looks rubbish and that’s not in at all… you go on a little further down the hill towards Loch a’Choire and round a bit of a corner and… OMG. There’s a slightly gnarly gulch across the glen, with a good potential sport-climbing-venue crag overhanging it on the left and all sorts of steep tussocky nonsense on the right, and above the gulch it breaks out into a big and spectacular amphitheatre with an overhanging rock-nose on the left, and above the amphitheatre on the right… Oh. My. Sweet. Lord. A double-band waterfall straight up a rock-face, 20m wide at the bottom and 80m high before the angle eases, well frozen to right and left but running down the middle, all chandeliers and pillars and stalactites, yellow and horned and crested, and massive. Simply massive. Massive and, even from a kilometre away, quite obviously really really steep: 80 degrees then 90 degrees then 60 degrees. People have been climbing in Scotland for 150 years, for heaven’s sake. 150 years, and no one’s done this before? So you cross the glen and scramble up the gulch in the deer-tracks, scattering the hinds out of their sheltered cove, trying to keep your boots out of the six-foot-deep break-throughs into the burn, and you gear up in the amphitheatre at the foot of the route. There’s so much spray it’s like getting dressed in a cold shower. And part of you hopes that a car-sized lump will come down before you start (missing you) and act as an official declaration that the route’s not in. Or that Steve’s test screw will go straight in and straight out again like the ice wall is a giant slush puppy. But no. Under the top inch or so it’s really good ice. So no excuses left. Up he goes and I’m standing there in the spray, listening to the thud and crunch of chunks of ice falling off the waterfall, watching the ice-spicules piling up like hourglass sand as the water-course hollows out the ice on either side of it, watching the ropes siphoning water off the ice like a running tap, trying not to move so I don’t get that clammy-clothes feeling all down my legs and back, trying to belay him from somewhere slightly less wet than anywhere else (there’s no such place). He has a long pause after about 8m (afterwards he tells me he was seriously thinking about backing off). But up he goes, up steps and grooves, steep but manageable, to a good ledge on the right after 30m, gets safe, lies down and has a good swear at his hot aches. Pitch 2. Steve goes left round an ice-pillar. First move he puts a screw in the pillar to back up the belay (just as well: see above) then he’s in a vertical sentry-box in the ice. He gets two parallel screws in and has a think. Then he just goes for it, straight upwards as quick as he can before his feet come off. He tells me afterwards he climbed it pretty much arms-only. He slithers when he gets on it but he controls it. Then I have a very good view of his anti-ball plates for about half an hour: he’s straight above me and moving very carefully indeed. It’s seriously steep, it’s like it overhangs the belay, and he’s got a screw in at the top of the sentry-box (hurray) and he’s chopping away a huge ice-umbrella so he can move up and left. Then he disappears over the brow—to my delight, because it means he’s on less steep ground. Another twenty minutes and he whoops, which is better still. Can’t hear what he’s saying but the tone is jubilant. I whoop back. Then up I go and oh my goodness it’s steep. Where Steve slithered, I pop off, and swear my head off. I thought I was going to do this clean but the vertical sentry-box is beyond me. My crampons aren’t sharp enough, the ice here is too flaky and cruddy, and I’m trying to do it too fast. Snakes alive, Steve, this is completely nails, how on earth did you get up this? I flail a bit. I stop and give myself a sweary talking to. Calm the F down. Take your effing time. Use your effing feet properly and get them kicked in better underneath the cruddy top layer. Go A-shape. And stop effing over-gripping. Once I’m above the sentry-box it’s okay. One way or another I get to the belay (which is excellent this time—a nut and a slinged boulder that would hold the Queen Mary). I carry on up the heather to the top and start coiling the ropes. And now I’m on the plateau, and it’s there. We’ve done it. It’s in the bag. High fives and back over the sleety moor in the dusk for tea and medals with Kai and Mike, where I hog Kai’s scones and the wood-burning stove, and try and get all of their collies on my lap simultaneously, to warm me up. This entry was posted in New Routes and tagged Ben Klibreck, Sophie Grace Chappell, Steve Perry. Bookmark the permalink. 3 Responses to Easan Feidh Climbed At Last! That write up alone sent my heart rate racing, so god knows what the climb did to Steve and Sophie Grace. One of the best stories of a new route yet on scottishwinter.com. Well done Sophie, oh and Steve too!